LSDI FFA3418 Premium Freeform Auger Bit 3/4" x 18"
This high quality auger bit is manufactured using advanced techniques. It includes an integral lead screw with course threads for accurate drilling. The lead screw is designed to minimize bit drift and helps to pull the bit through the wood so that you can drill with less effort. Made of heat treated, high quality carbon steel for strength, the bit has wide flutes to carry drill debris and chippings away from the bit head to reduce clogging. 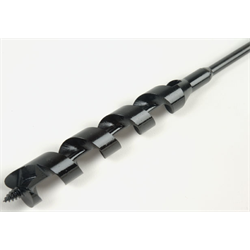 The shaft is 18” long and has a standard 1/4” diameter shank so it can be used with our 1/4” shank EXT Series flexible drill bit extensions. This increases the effective bit length in 2ft, 4ft or 6ft increments. LSDI FF1248F Premium Freeform Bit 1/2" x 48"